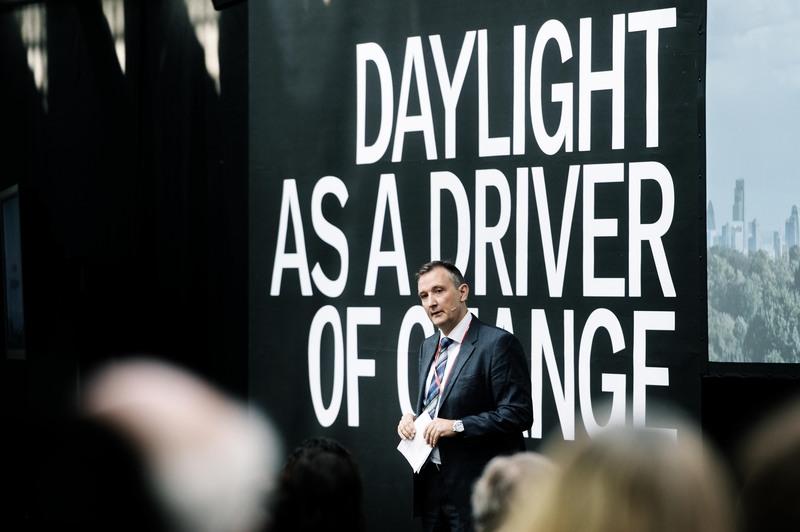 The VELUX Daylight Symposium celebrated its 10th anniversary with a two-day conference focused on daylight as a driver of change in today’s 24/7 society. The Symposium took place in London on 2-3 September and paid tribute to the 2015 International Year of Light proclaimed by the United Nations and Unesco. Designing with daylight was the central topic of the keynote lecture by David Nelson, Head of Design at Foster+Partners. Taking the audience through examples from the global design portfolio of his company, Nelson demonstrated the immense opportunities in daylighting to create the right atmosphere and conditions that match the local environment and purpose of buildings. With more than 350 participants from all continents, the Daylight Symposium has grown into one of the most important events that the global community for daylight specialists sharing important research, tools and knowledge for daylighting design. The morning session on the first day of the Symposium was dedicated to a discussion on the importance of daylight for human well-being and health. The lectures ranged from highly scientific studies on human biology and circadian rhythms to actual design programmes and solutions for hospitals, schools, office buildings and private homes. Among the interesting approaches was Professor Koen Steemers’ focus on architecture for wellbeing – what he called ‘nudge-architecture’ – which means buildings that actively encourage people to connect with each other, be active and keep learning for better health and happiness in life. Christoph Reinhart from the MIT Sustainable Design Lab introduced his ideas to get people more outside and more daylight inside buildings in dense urban areas. And Marilyne Andersen, Professor of Sustainable Construction Technologies at EPFL in Switzerland, proposed approaches and tools to human-centred design. The afternoon session looked more specifically at how daylight can benefit rapid recovery at hospitals and enhance the learning capabilities of children at school. In her thought-provoking lecture “First – do no harm”, Deborah Burnett from Benya Burnett, USA, advocated for a close cooperation between architects and medical doctors in order to make sure that proposed lighting solutions are truly beneficial to human health. – “Exposure to light is like a drug that changes something in the body”. Therefore, it is not enough to presume that what we practice is good for people’s health, we need to work on safer ground in close cooperation with medical specialists, she said. Poul Bogard, author of the book “the end of night”, emphasized, that light pollution does not only harm us – it also damages the ecology around us. He regretted the absence of complete darkness or starry nights in many parts of the world. On the second day of the Symposium, the speakers explored tools and methods for designing with daylight and raise the question whether current daylighting regulations are sufficient for design of buildings, that support people’s health and well-being. In the afternoon, the winners of the Natural Light competition were presented and celebrated after a moving keynote lecture by Olafur Eliason. 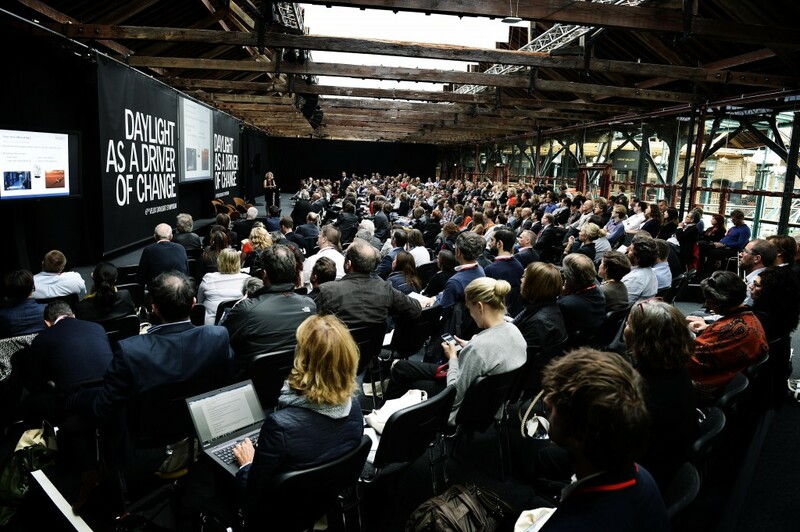 The Symposium took place at Tobacco Docks in London’s East End, a historical warehouse complex first constructed in 1811 to store and dispatch tobacco from overseas to British customers and now converted into a spectacular daylit conference venue.